The athlete in me first sparked in grad school, when I turned to yoga and running as a way to de-stress. I picked up road biking along the way, and one of my favorite things to do is get away from the city and go on long bike rides in warm weather. I began road biking towards the end of my grad work in 2010, when I participated in the Breakthrough Ride - a relay-style cross-country bike ride from San Francisco to Washington DC for the Alzheimer’s Association. The ride consisted of all Alzheimer’s researchers who collected signatures for the Breakthrough Act and other legislation at “signing events” along the way, ultimately delivering these signatures to Capital Hill (the slogan: “The toughest hill to climb is Capital Hill”). My leg of the journey was 350 miles over four days between St. Louis, MO and Madison, WI, the longest consecutive miles of any rider. Many people asked if I was an intense biker before that point and the truth was I had never gotten on a road bike in my life before I signed up for that ride. I bought my bike and trained hard for 2.5 months. Everything on my bike was so new and scary (nevermind the fact that I had terrible tires back then and got very familiar with YouTube flat-fixing tutorials on the side of the road) but when I finally reached the capital building in Madison I had never felt so incredibly rewarded. To top it off, the ride helped pass the National Alzheimer’s Project Act, which was signed into law in December 2010 by President Obama. This created a national plan to combat Alzheimer’s and related dementia, which included an increase in federal funding for Alzheimer’s research. My mother was diagnosed with Alzheimer’s at age 56, so this athletic accomplishment was particularly sweet. I am going to partake in the Olympic Distance Boston Triathlon in July. This is particularly challenging for me because I have never swam competitively, and have never swam in open water. But I just think back to 2010, when I never biked any distance of significance and managed to bang out 350 miles. I will just train appropriately in the water and crush this goal as well. This may be slightly more difficult for me now than it was back then since I now have a baby under one to care for in addition to training (and work) - but I am a firm believer that the more energy I gain through fitness makes me a better mother, wife, friend, employee, team member and person overall. 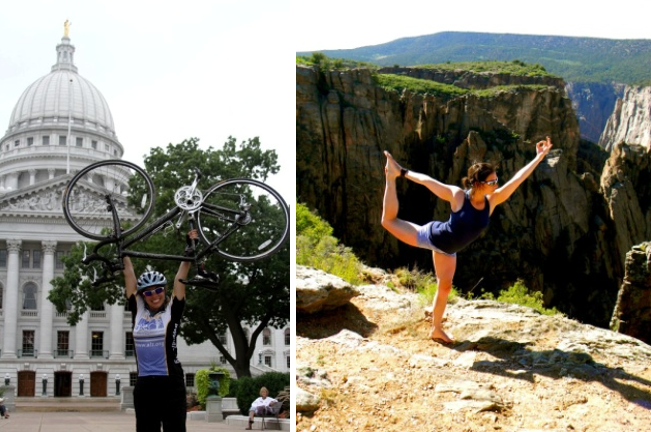 After I graduated in 2011, I began yoga teacher training and a postdoctoral fellowship at the same time, which was a pivotal point for me in both my athletic endeavors and in my career. I began to teach yoga at my crossfit box around the same time I decided to switch career paths and join the biotech industry. Diving head first into a deep yoga practice that went hand-in-hand with teaching yoga allowed me the soul searching I needed to make a big career decision. Being more mobile and centered in general helps me excel in other athletic endeavors, such as running and biking, and the more athletically fit I feel gives me more confidence in other aspects of life, including in the workplace. I have had some major setbacks with health (and work as a consequence) throughout the years, but my athletic training has taught me to keep going – on the other side of the wall I will persevere. I am now searching for a house along my favorite bike route.